The top-selling kegerator from Edgestar is the Edgestar KC2000. 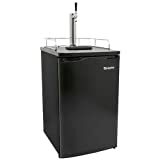 It is an entry-level kegerater that will suit the needs of most people who are looking for a full-size kegerator for homebrew or commercial beer dispensing. If you don’t want to spend a lot of money to get a more robust system, then this one might be your winner. At just over $400 – $500, the Edgestar KC2000 is a fantastic deal. The Edgestar dual-tap KC2000 was my first kegerator purchase. It’s sleek looking and slim, so it fit well in our living room without looking out of place or clunky. In fact, it was hard to notice it was even there, so you don’t need to worry about it standing out like a sore thumb in your house. The best part about this kegerator is that its reliable and has commercial grade NSF-approved air and beer lines that have met strict standards for food and public health safety. There are a few drawbacks to the KC2000. One is that it produces quite a bit of noise. If you have it stored in a basement or garage, you probably won’t notice it at all, but in a quiet setting, like a living room, you will notice the noticeable cycling of the machine. It can also produce a popping noise from the expansion of the parts. If you encounter that issue, it’s best to contact Edgestar for a part that will fix the issue. Overall, this is a reliable entry kegerator. It doesn’t have a lot of bells and whistles (lacks internal lighting and a precise temperature control guage), but for the price it is a good value and is easy to set up, plus operates with very little maintenance. This kegerator has an external dimension, including the draft tower of 48 1/2″ H x 20 1/10″ W x 24 13/16″ D. It’s always wise to measure the space you have at home and make sure the kegerator will fit with a little bit of extra space on all sides. Keep in mind that you need even more space behind the machine for the CO2 tank. The unit has castors and a protective metal floor plate for durability. The only thing you’ll really need to purchase as an add on to this kit is the coupler for using homebrew kegs (if you’ll be doing that). Here is a video and other installation information available from Edgestar that will help you with the setup and installation. One of the things you should definitely consider when buying a kegerator is the configuration of kegs that you will be using. The Edgestar KC2000 does support the use of half kegs of Coors and Miller, or any keg that has rubber around the keg, making it too wide for this kegerator. KC2000SSTWIN) and a triple tap. Some version even include a digital thermometer, though the basic KC2000 does not. Is the Edgestar kegerator not cold enough? One of the main concerns with a kegerator is whether it can reach a low enough temperature, and you don’t have to worry about that with the KC2000. It can reach temperatures in the low 30s to 50s, so it can be changed for the type of beer currently on tap. The Edgestar kegerator thermostat adjustment process is easy. I don’t know about you, but I prefer my beer to be served at the proper temperature. Edgestar claims that this is the coldest kegerator on the market. Keep in mind that this kegerator is meant for indoor use only and may not function properly if stored or used outside, or in especially humid, cold or hot environments. If the kegerator isn’t getting cold enough, according to your temperature gauge, Edgestar support will provide instruction on how to fix that issue. When making a purchase of this size, you want to be completely sure you’ve answered all of your burning questions and know exactly what you’re getting. Here are a few top questions that are often asked about the Edgestar KC2000. Q: Can the KC2000 be used outside? A: This unit is for indoor use only. Q: Can it be built in to the cabinetry around it? A: No, this unit is meant to be freestanding only. If you want a built-in unit, you need to upgrade to the KC7000SS. Q: Is there anything else I need to purchase extra to use this kegerator? A: This kegerator comes complete with everything you need, except for a CO2 canister and a keg of beer! There is nothing else you need to buy to use it. Q: How long will a keg of beer stay fresh in this kegerator? A: A keg of beer typically stays fresh for about 6-8 weeks when kept under the right pressure and temperature. We’ve been able to go up to 12 weeks maintaining freshness. Q: What are the dimensions of this kegerator? A: The kegerator has a depth of 24.813, a height of 48.5 and width of 20.1. It weighs 81.6 lbs. Does not support the use of oversized-rubber ¼ barrel kegs and beveled-wall ¼ barrel kegs. Adjustment of the thermostat to reach the desired temperature is necessary. Many people swear by the Edgestar brand and really love this kegerator. It’s a good value for money, and it’s a reliable refrigerator. If you ever have an issue with it, customer service is fast to reply and willing to help troubleshoot issues. It really comes down to what you’ll be using it for and how much room you have for it. If it fits your needs, we think this is a good, reliable home kegerator option.